Trick or Treat! 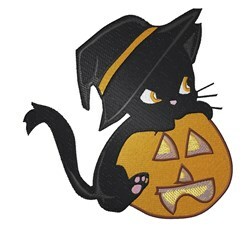 Set a spooky mood for Halloween with this hissing cat design on clothing, throw pillows, framed embroidery and more! King Graphics is happy to present Cat On Pumpkin machine embroidery design which has 20662 stitches and is [121.16 mm x 119.63 mm] large. If you would like to view more embroidery patterns please search on our embroidery designs page.